7 posts categorized "Progressive Los Angeles"
I am sending you two important pieces by journalist Harold Meyerson. The first -- linked here -- is his final "Powerlines" column in the LA Weekly, a retrospective on LA politics and the LA Weekly's role as a progressive voice in our community, during his almost two decades at the paper. It is his final column because the new owners of the Weekly let Harold go. Don't mourn for Harold. He's doing fine from his pundit perch in DC. He was recently promoted to editor of the American Prospect and will continue as a regular columnist for the Washington Post. But mourn for LA, which will miss Harold's strong reporting and commentary on LA politics and movements for justice. It’s hot out there, and one of the reasons it might get even hotter in the years to come in LA, is the continuing push to pave even more of the little green space we have. When Judge Helen Bendix ruled against the South Central Farmers, and developer Ralph Horowitz once again indicated his preference for warehouses over green space, it was also a victory for the urban heat island effect. In 1967, an article in Scientific American first raised the concern that certain characteristics of urban development caused temperatures to rise in urban areas. In the summer, researchers have pointed out that we might be as much as five degrees hotter in Los Angeles due to our hot roofs and pavements, and the lack of vegetation, green space, and trees. More freeways and more black top, more diesel trucks and more warehouses have all kinds of environmental consequences, including forcing us to bake even more in the sun. More gardens, more trees, different strategies for development could begin to cool us down. Too bad the tendency always seems to go in the direction of more, not less heat. At a community forum this past Saturday with L.A.’s new Planning Director, Gail Goldberg, fifteen community residents that had been brought to the forum by the Korean Resource Center wanted to talk about the desperate need for air conditioning, especially for seniors and anyone else vulnerable to this god awful heat wave. They didn’t get much of a response that day, and, as it turns out, it’s hard to get a response through any of the formal channels to register complaints involving the various housing bureaucracies. This is especially true for renters who have been promised air conditioning in their leases but never had it, or when their air conditioning system breaks down and the landlord doesn’t fix it. Landlords have even denied tenants the right to install their own air conditioning if “no a/c” is part of the lease, including when the tenant pays the electricity bill! Landlord interests have been successful in preventing any requirements to fix or install air conditioning to be incorporated into the Housing Code. Nor have the Supervisors, or the City Council, or the Mayor and the Housing Department developed approaches that can facilitate action in this area, especially with the kind of crisis we’re experiencing right now. 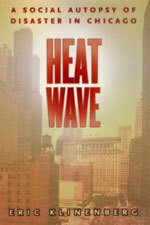 In 1995, Chicago experienced a heat wave that resulted in more than 450 deaths; deaths that happened in part because of the failure of policymakers to create the support mechanisms to allow the most vulnerable to withstand the heat. Eric Klinenberg, whose compelling study (“Heat Wave”) of what he called an “environmentally stimulated but socially organized catastrophe” has important lessons for what’s happening now in L.A. and other parts of the country. Let’s hope we won’t see a similar catastrophe happen here because the air conditioning is broke, or a landlord doesn’t allow a tenant to install one, or that the policies we’ve developed to get air conditioning fixed or installed turn out to be broken as well.